Perhaps more impressive than the length of Vinnie's credits is their quality and breadth. From his groundbreaking days with Frank Zappa and progressive projects with Allan Holdsworth, Chick Corea, Bunny Brunel, and Los Lobotomies, to the mid-regions of avant garde jazz-with many forays into intelligent pop a la Joni Mitchell, Gino Vannelli, Julia Fordham, and Sting along the way-it seems there's no one Vinnie hasn't worked with. So what happens when someone who's played with virtually everyone gets a chance to compose, arrange, perform, and produce the music that's in his own mind and heart? 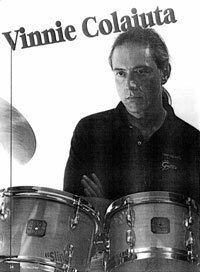 A deeply personal album, with an appropriately personal title -Vinnie Colaiuta- whose eclectic styles are unified by the technique and touch of one of the most gifted drummers of our time. RW: Out of all the tunes on the album, you almost instantly chose "Slink" to be on the Hot Trax disk. Why? VC: Probably because it's more direct playing rather than production, with small group instrumentation, which I thought would be more appropriate in this particular situation. RW: Your album covers a number of styles, but with the exception of the ballad "Darlene's Song," much of it leans toward a funk-jazz or rock sensibility. Especially since all of the compositions are yours, can we assume that this kind of drumming is closer to your heart than, say, trad or free improvisation? VC: Yes and no, as the album is a partial representation of my influences, and where I was then. RW: Are there any musical contexts or styles that you feel you don't have a handle on, or that still challenge you? VC: Yes. I don't have a functional working knowledge of ethnic styles, such as Afro-Cuban, ctc., which have increased in popularity. I don't really have a handle on the vernacular, so to speak; I just sort of feel it-fake it, really. But I suppose that being able to hear, feel, and integrate the substance of that music is the bottom line anyway, as opposed to just having a bunch of theoretical knowledge of it. However, it certainly would help a bit, I think. RW: Tell me a little about Vinnie in the studio. How did your approach - for example the number of takes on the drums - on Slink differ from all the recordings you've been on when you weren't the producer? VC: I generally didn't do a lot of takes. In fact the acoustic drums were among the last elements in the recording chain. RW: Are you one of those guys who believes that, with high-caliber musicians, the first take is almost always the best? Or do you tend to want to refine and refine and refine, with multiple takes? VC: Yes and no, again. It depends on the situation. However, I do feel that with too many takes there is a point of diminishing returns. RW: At least in its instrumentation¬stereo Rhodes and muted trumpet-and production, "Slink" sounds like it might have been a subtle homage to '70s-era Tony Williams. Were you thinking of him when you wrote or produced that tune? VC: Yes. I would say that it's more obvious than subtle. It is me paying humble homage to Tony. RW: Did you conceive of the melody and drum part on the head as alternate bars of seven and nine, or as four with the second half "displaced"? VC: Off the top of my head, there's one or two 2/4 bars in there, but basically it's in 4/4. It's the way that it is phrased that probably makes it sound otherwise. RW: The pattern you play at the top "turns around" every other bar, which is a device I've heard you use on other tunes. Do you like the idea of "tricking" or unsettling the listener-and if not, what is it about this device that appeals to you? VC: I don't normally think of "tricking" or unsettling the listener, particularly with an attitude of mischief. The tune "turns around" because it sounded good. I wrote it that way, and that's how it came out, that's all. RW: You integrate your double pedal work into your playing with a lot of technical and musical fluidity - for example in the fourth phrase of your solo. How did you develop the flow and balance between your upper and lower body? VC: Just by doing it, and experimenting with feeling comfortable and balanced until it worked for me and what I wanted to express. RW: Almost all of the tunes on your album sound more compositional than "drumistic." Do you write primarily to provide a vehicle for the kind of tunes you want to drum to, or do the melody and harmony have a life of their own that supersedes the drumming? VC: I conceived of the tunes as having a life of their own, I would say. I exactly preferred having the record be more compositional than "drumistic" from a compositional standpoint. Even more than that, I wanted a good balance of the writing and playing. RW: Which of your past projects have had the greatest influence on your drumming? Can you point out anything in "Slink"? VC: Quite a few, but nothing I can think of that relates directly to "Slink," other than an homage to Tony. RW: I've heard that you don't really appreciate when drummers try to emulate your style. Why not? VC: Well, I appreciate that imitation is presumably the sincerest form of flattery, but I think it's more important to know why you're imitating someone in the first place - and then move on. Also, it could be because maybe there are aspects about my own playing that I don't even like. So, there are elements of subjectivity there, and I think that it's important for the "emulator" to understand that. RW: Among drummers you are perceived to be pretty much omnipotent. But are there any performances, and especially any recordings, when you surprised yourself at how well you played? VC: Perhaps, but I can't think of any. RW: Okay, flip side of that - it will do us mortals good to hear if, other than the odd "bad night," you had a gig where you felt like you really stepped on it. RW: What made it a bad gig? VC: Maybe not being "in the moment", or thinking too much, or projecting too much, or just not being prepared. I don't know, maybe I ate something bad, too. Plus: James Brown, Elvin Jones, Led Zeppelin, Jeff Watts, Al Foster, Joey Baron, Peter Erskine, Dennis Chambers, Steve Smith, Steve Gadd.